'Shop Contest: The Big Battlefield, Winners! Battlefield V is coming, and there’s a lot going on. Planes and tanks, shootable grenades, and a whole lot of havoc and mayhem are coming on down the line. I asked you last week to make it even more chaotic, and you delivered. The ceiling for weird things in video games is very high. We can cram whatever we want into them, and as long as the game remains vaguely fun and playable it doesn’t seem to have much effect in either way on our enjoyment. When I saw the excellent Battlefield V trailer, I thought that it would be appropriate to ask all of you to work your image editing skills to take the game beyond whatever boundaries of historical realism people were trying to gather around it. I asked you to make it very weird. 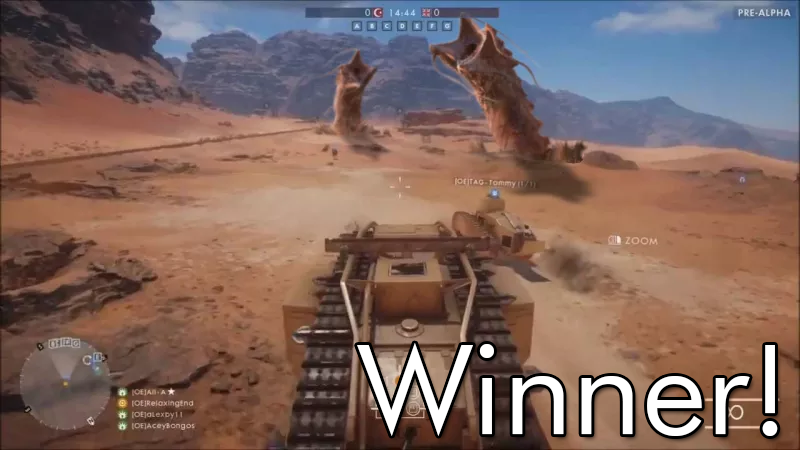 Our winner this week is Andy Havens, whose excellent work combining Battlefield 1 with the notorious sandworms of the desert planet Arrakis gets my science fiction heart going all aflutter. Now I just need to know if those sandworms can dodge a bullet or not. The honorable mentions also crafted a dangerous Battlefield experience, and I encourage you to check out the original post for all of the exciting things that everyone made. Crazy Tom found the ultimate teammate for the true World War experience. There’s a 50/50 chance that this exact scenario that Mister Fox cooked up will appear in a Jurassic Park film within the next decade. sciteach knows the true meaning of war, er, friendship? Bob found the crossover hit that would finally unite the Boomers and Millennials in fundamental ways. ...and cecil_banon has dug even deeper into the conspiracy theory universe to produce the true narrative of what happened. However, Tested_Ninja made an image with Mothra in it, so it might definitionally be the canonical take. Christopher Thomas combined two incredibly chaotic battlefields into one massive experience. I can’t wait to level up. Mrichston slammed everything together to figure out what makes the best game. Frank Hackett knows that you need armor-piercing bullets at an extremely large caliber to punch through the iron hides of flying dragons. Done with Kinja knows that we’re going to have to do this, over and over again, no matter how good we play. So we might as well get good at it. &apos;Shop Contest: Kingdom Hearts Expanded Universe, Winners! &apos;Shop Contest: Put It On The Switch, Winners! &apos;Shop Contest: Headed West, Winners!